Pulsair build the fastest, most energy efficient wastewater mixing system for sewage lift station. It’s low maintenance and keeps all the raw sewage uniform sewer lift station before it is pumped to the central wastewater treatment plant. 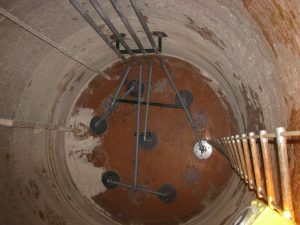 The Pulsair sewer lift station mixing process is the best solution for handling odor and toxic gases and helps keep fats, oil and grease caps (FOG) from building up in lift-stations and wet-wells. Sewage wet wells (lift stations) are designed to store raw wastewater prior to arriving at the main wastewater treatment facility for processing. Challenges arise when fluids are stored over long periods of time at lift stations and can negatively affect the wet well and the entire wastewater treatment process Pulsair Systems offers an effective and low energy cost solution for breaking up troublesome grease caps, reducing toxic gases and odors in sewage lift stations. Wet-well lift-station mixing with Pulsair Systems from Pulsair Systems Inc on Vimeo. Contact Pulsair to learn more about our efficient sewage lift station mixer.